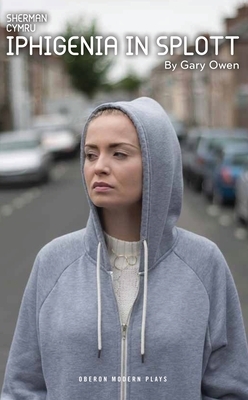 Iphigenia in Splott (Paperback) | The Drama Book Shop, Inc. Stumbling down Clifton Street at 11:30 a.m. drunk, Effie is the kind of girl you'd avoid eye contact with, silently passing judgement. We think we know her, but we don't know the half of it. Playwright Gary Owen uses the Greek myth of Iphigenia to tell a modern story: exploring social deprivation, poverty and class in contemporary Wales. Welsh playwright Gary Owen is a past winner of the Meyer Whitworth, George Devine and Pearson best play awards. In June 2015 he will make his Royal Court debut with Violence and Son. His other plays include Love Steals Us from Loneliness, Crazy Gary's Mobile Disco, The Shadow of a Boy, The Drowned World (winner Fringe first), Ghost City, Cancer Time, SK8, Big Hopes, In the Pipeline, Blackthorn, Mary Twice, Amgen, Broken, Bulletproof, The Ugly Truth and Free Folk. His adaptations include Spring Awakening and Ring, Ring, a new version of La Ronde for the Royal Welsh College of Music and Drama and Dicken's A Christmas Carol for Sherman Cymru. He is a Creative Associate at Watford Palace Theatre, where his plays We that Are Left, Mrs Reynolds and the Ruffian, and Perfect Match have been produced.